In spirituality, if you aren’t going all the way, then you aren’t working with your entire desire. Then it bears no relation to your spiritual progress. However, you don’t even know where “all the way” ends, what is the maximum. You can only imagine it in some way. But what became revealed to us instead? How much we are internally unable to come even one inch closer to it! We cannot accept the need to unite, to cancel ourselves. As soon as we started talking about the connection between us and the inner work we have to do, our desire immediately cooled down. We are not ready to attain the spiritual world with that price tag! This means we had misunderstood the Upper World and did not realize that it was the quality of bestowal, above our egoism. Yet we felt this necessity. After three days filled with many inner actions, we came out disappointed. And this disappointment comes from the fact that we are unable and do not desire to attain true spirituality. We desire to remain in our definition of spirituality as something that is simply good, eternal, and pleasant in our current, egoistic desires. What did we reveal? It was the left line, our own evil inclination, the fact that we desire to receive spirituality inside our egoistic desires just like in the material world. Why didn’t we receive it? It’s because it’s not necessary to receive anything in spirituality. It is open. If you want to bestow, then go ahead. Everything’s permitted and anything is possible. No one can steal that from you. In other words, inside our ego we revealed that our definition of spirituality was incorrect. And this will become revealed to us on all 125 levels! Now we still don’t see that our nature is opposite to the spiritual nature, that we are unable to attain it, and that we have one single opportunity left: only to cry to the Creator, to ask Him. This is already the right line. We have to rise above ourselves and the middle line will emerge from that. Nevertheless, we have accomplished great work. The despair that took over us, the pain and futility that became revealed in us showed us the inability to attain the spiritual world inside our egoistic desires. In essence we were asking for spirituality to become revealed precisely inside these desires, rather than in the bestowing desires. Now, after this realization of evil, we will enter the right line, will correct ourselves, and attain the middle line. A great Light had to pour from Above in order to show us how much we don’t desire and aren’t capable, how opposite we are to spirituality, the degree to which we do not want to think about unity and love between us. All of that is “holiness of day” because we united together and nevertheless desired to ascend spiritually in some respect. We revealed the degree or desire above which we have to ascend. However, for now we are unable to do so, yet we have to do it in order to ascend to the first degree of the spiritual ladder. That is why I am very happy with the results of the Convention and I very much hope that in the near future we will already reveal all three lines as the middle line. In order to acquire a new perception, we need a big desire that will allow replacing the tendency to consume with the aspiration to bestow. This transition towards an inverted perception of the world with an aspiration to bestow is extremely difficult. It is similar to birth, and birth is always an extraordinary phenomenon, even during the age of modern medicine. The infant breaks away from a special place that he was attached to. Here he used to receive special nutrition and protection; here he was subject to special laws of development. The environment did not reject him; rather, it nurtured him. Now he enters a hostile world, a new environment, where he must struggle to live and grow. This is an unparalleled revolution in his life. The same happens during the spiritual birth. A new universal sense becomes revealed, a sense of external sensations (outside of the womb or this world) based on bestowal, and thus, we begin to perceive a new world in it. At the Convention we took a big step ahead in this direction. We really wanted to be born, we slightly experienced contraction and saw that we are unable to do it. We felt something stopping us and throwing us back right away. In combination with the good force that draws us forward, we felt a bad force that pushes us back into the mother’s womb, does not let us leave its boundaries, this world, and does not let us feel the new world. We need to feel several contractions like this before we are born. The quantity and the frequency depend on us. Anyway, the birthing process will not end without them, and we will not make it outside. Two forces collide during birth: our pressure from within and the opposite snatching from the outside. Their confrontations beget a new strong desire in us to end up in the spiritual world. We cannot do it without this desire. Birthing contractions in the Torah are referred to as the “plagues of Egypt.” Our egoism must experience ten (the full dosage of) afflictions, which become imprinted on the desire and turn it into the shape of a vessel, a Kli. This way a shapeless “piece of clay” becomes a vessel ready to receive the Upper Light, the spiritual world. We must experience the contractions in order to take the correct shape, without which it is impossible to perceive anything spiritual. We entered this process at the Convention. With regard to the Light, it is around us and is waiting for a place to enter. The purpose of our entire work is to reveal the Creator. We lack Him. Beside Him, there is nothing else in reality. The Creator is the all-inclusive force that we are part of, even though we do not perceive it. Our egoistic desire does not distinguish the Creator, it is not tuned into the same wave, does not possess the property that He does. This is why we work specifically on our desire that needs to be changed, redirected in order to reveal the Creator according to the law of equivalence of form. Right now we see, hear, touch, and smell in our desire. By changing it, we will expand the range of sensations. But this does not mean that we will increase the sensitivity of our senses through additional tools, such as radars, radios, telescopes, or microscopes. We do not increase the sensitivity of the egoistic desire. Rather, we are changing its essence, we switch it over from the internal perception onto the external one and add an ability to detect things that are on the outside instead of those that come inside. When the desire becomes transformed this way, it expands from the five physical (corporal) senses (sensations) of sight, hearing, smell, taste, touch into the five spiritual senses or Sefirot: Keter, Hochma, Bina, Zeir Anpin, and Malchut. Now it operates in the opposite manner: It bestows instead of receiving, and we perceive the higher reality in it through the aspiration to bestow. Even though we are not yet familiar with it, things can change. This is what the people who have already done it and acquired a completely new life tell us. Right now we live in a reality of five senses, a picture of a world painted by an egoistic desire. But once we switch the intention of perception, we come out from within us and start perceiving the external reality in the property of bestowal, which we acquire in addition to the property of reception that we already have. This is a new world that becomes revealed to us in the five new senses. It has its own colors and sounds, mind and movements of the soul, that is, it has everything that we have here and much more than that, much more clear and perfect. These are our earthly roots. This is what we need to reach, what we want to come to. After all, our egoistic desire that operates according to the principle of consumption has already exhausted itself. Our egoism becomes increasingly desperate, and we are losing interest for “the film” that we have already seen and reviewed. We no longer care for this life’s film, and it no longer fulfills us. The entire mankind is coming to this. Perception turned inwards no longer pleases us. We have exhausted its reserve and now begin to strive towards external perception. Only once we change our desire and switch to the outside from the inside will we see an inverted world, the world of bestowal, as it is said, "I saw a reverse world" (“Olam Afuch Raiti”). From Daily Kabbalah Lesson 11/12/10, "Come unto Pharaoh – 1"
No matter how tired we are from the efforts of reading The Book of Zohar, no matter how tasteless it may seem, during the reading we must all be united in one intention, one desire. This is our shared work in mutual guarantee against the inner disturbances of every person in our thoughts about unity. We want to sleep and tune out, losing the thread of the narration. We wander around in a fog, and the text does not attract us or elicit any feelings. Yet this is the place that contains the Light, which has to make the correction inside us, bringing us to unity, to the spiritual form. We have to yearn for unity from our side and wait for an action from the side of the Light so it will turn us exactly into what is necessary. We want to unite and focus on the single desire to be together when every person bows down his head. I make this effort and desire for the Light to perform its action from Above in response. This is called “Israel, the Torah, and the Creator are one.” By means of the Torah we are trying to reveal the Creator. The Torah is the Light that Reforms and unites us, and the Creator will become revealed inside our unity. Let the anchorman keep reading. To me every word is a new drop of Light uniting us into one whole. I am turning to all of our friends from all over the world: We lack this joint effort. Question: I cried from joy during the opening ceremony when the representatives of all the countries got on the stage holding the flags; I felt connected with everyone; I felt the desires of other people, their love and care. What was this, a psychological sensation or was this spiritual? Answer: This is a wonderful, kind, heartfelt emotion, but this sensation is not yet spiritual. A spiritual sensation is the attainment of the root: where everything comes from, the reason everything happens, and the place where we are. This sensation must bring us to a state where we exist in an ocean of a certain force, which connects us above time and space, and supports us. Then one loses the sensation of a body. He still associates himself with the body, but he considers it to be of a lower nature than him. Then we perceive that we belong to that same force, we are part of it, and we become diffused in it. What you experienced at the opening ceremony is the step before the spiritual perception. Let us hope that we will reach it very soon. We exist in the system of precise laws. Everything we discover we build independently. In the descent from above downward, everything exists in the form of Reshimot (reminiscences), the primordial foundation, and while ascending from below upward, we uncover all the characteristics of these Reshimot, and through our desire, attainment, and aspiration, we create the picture of the world from these parameters and form spiritual rungs. This is why we cannot leap through the stages of development and jump onto a complete rung. There is nothing complete. The rungs are not ready; they exist in concept, in the form of Reshimot, and are not filled with life. When all the necessary data are entered into our system, when all of us mutually connect and desire to revive Malchut (Kingdom), the Reshimot come alive and reveal the picture of the world to us. Malchut is the world. Question: What does “to revive Malchut” mean? Answer: I reach Malchut, the place where the Reshimot are stored, and revive these Reshimot with my effort, desire, and life force. In Malchut, all Reshimot mutually link and the spirit of life flows in them, all because of me. I raise my spiritual desire and in accordance with this desire, Malchut attracts the Light from Above, and I see the picture of the world in it. I always see my own picture of the world, all the 125 rungs, in Malchut of the world of Atzilut (Nobility). If I demand, beseech, and desire to revive the entire system that is contained within Malchut in its primordial, broken condition, I will see this picture filled with life. This is what is called my spiritual life. When spirituality becomes revealed to a person, he or she begins to feel that a certain force fills the entire space around him, that it exists in this world. It is as if the air becomes more dense, thick, and gentle. This is the Creator’s force, the force of bestowal, the force of love that fills the entire world of a person. We must evoke and demand it so it would reveal itself to us as a force that connects us together. Through it we will begin to perceive us all as one whole. We just need to pay more attention to it, search for it lovingly and sensitively. Let us begin to feel it! The Book of Zohar requires a special preparation on our part. It is the most powerful source of Light and the force that will change our nature if we correctly prepare ourselves for working with it. First of all, in our current state we have to maximally correspond to the Upper Light that The Zohar brings us. This is why, as much as we can, we are trying to become similar to the authors of The Zohar, Rabbi Shimon and his nine students. They explain that in the beginning of the spiritual work, the revelation of The Zohar, the Light of Hochma of the World of Atzilut, they are suddenly overtaken by mutual hatred. The Light they attract shines into their desires, and despite their yearning for unity, what arises among them is repulsion. Standing before the illumination of The Zohar, they see that they are opposite to it. The path begins with the revelation of evil; a person has to feel this every time. Otherwise his first step will be incorrect. It is written, “I created the evil inclination and I created the Torah as a spice because the Light concealed in it returns us to the Source.” This is talking about three lines. 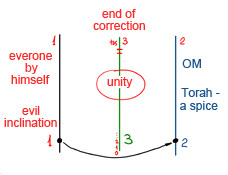 The evil inclination is the left line, the Torah or spice is the right line (the Light that Reforms), and the middle line is our corrected soul, the desire of the left line that has been corrected by the intention of the right line. The evil inclination, egoism, does not come by itself, but under the influence of Light. Then we turn to the right line, the Torah, and the Light that comes from Above returns us to the Source, the Creator, the middle line. The revelation of evil is the beginning of every phase on the path to coming closer to the Creator from zero until the End of Correction. Even the group of Rabbi Shimon, which was on very high levels, went through the same phases. Without revealing our enemy, we cannot study Kabbalah and attract the Light. We are trying our best to unite, but then we feel that our heart is deaf and that a stale taste lingers in our mouth. Yet the goal is great and it evokes the need for the Light, the Creator who will come and correct us. We will no longer leave Him alone until He appears and establishes a connection between the friends so we will become a common Kli in mutual guarantee, as one man with one heart in one desire. This is what I demand. Even if I don’t know exactly what this means, even if I don’t have the smallest inclination to unite, I am still shouting together with everyone. That is how we are approaching the reading of The Zohar, from the desire to unite. Unity will enable us to attract the Upper Light. At first every person is by himself, and then by way of the Surrounding Light (Ohr Makif), we will come to unity. In this unity we acquire the Upper World. The spiritual degree surfaces inside our interconnection. At first we reveal the evil inclination between us and then we demand the Light that will unite us. Then the Light does its work and unites us in the middle line, in the common desire. Question: I feel that the principle of spiritual work, “If I am not for me, then who is for me?” contradicts another principle, “There is none else beside Him” and connecting with the group. Answer: I have to say to myself: “If I do not help myself, no one will help me reveal the Creator” because this refers to the desire to reveal the Creator, the property of bestowal. Nobody can help me with this. I can read a thousand books and listen to a thousand lessons, but at the end, the development of the desire is my inner work. I will reveal spiritual life (in the property of bestowal) only if I desire it instead of this life (in the property of reception). There is no point in waiting for someone to help me. My desire should be so strong that for me “death is better than a life like this!” After all, this life is no life for me. I must attain spirituality! Here I have to act according to the principle “If I am not for me, then who is for me?” This is because the Creator will not reveal Himself on His accord, He will not force the desire for Him on us. He gives fulfillment, not the desire. There is no coercion in spirituality. But as soon as “If I am not for me, then who is for me?” reaches its completion, that is, I begin to understand that this only depends on me, then I immediately discover that I am unable to do it. I hate my egoism and I fear it like Moses fears Pharaoh. And then “they cried out because of this work” to become free of the power of the ego because neither I nor anyone around me can help me. When we attain these two sensations, the lack of help from the inside and the outside, it is referred to as the last birthing contractions. Then desperation bursts from the very depth of the heart, and only then the Upper Force, the Light (GAR de Hochma), which births man on the spiritual degree becomes revealed. At that point, the principle of “There is none else beside Him” begins to operate.